Since 2000, InSync Training has pioneered a tradition of leadership in the training field by researching, vetting, and promoting best practices in virtual classrooms and modern blended learning. Our team of virtual learning experts set industry standards for quality and creativity, supporting blended learning initiatives of organizations within any industry. Our programs and services incorporate a variety of instructional delivery methods, learner needs, and cognitive theories to optimize learner outcome and effectively facilitate modern workplace learning. We look forward to partnering with you to achieve your goals. To support the mobile, global workplace, InSync Training offers digital badges upon completion of certificate programs, workshops, and Virtually There team events. These badges contain information about the program, and allows employers to quickly understand an employee’s skillset. Certificate programs are accredited by the International Association for Continuing Education and Training (IACET) and InSync Training is authorized to issue the IACET CEU. 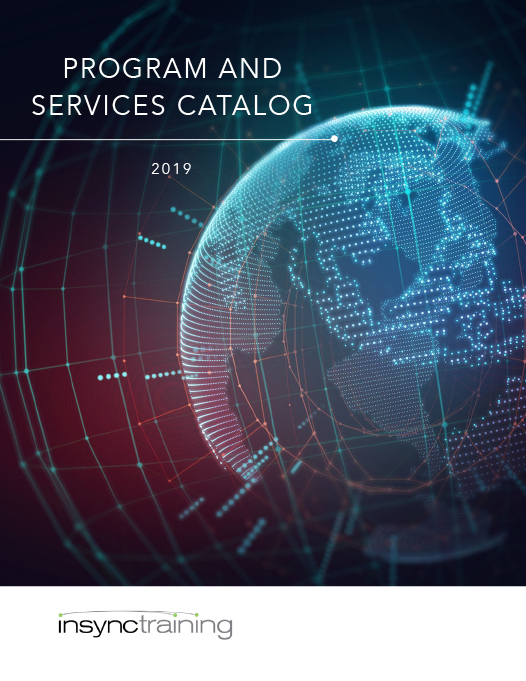 To download our Program and Services Catalog, please complete the form on the right and click on the Submit button.